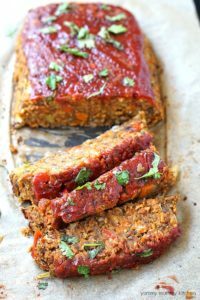 This easy veggie filled vegetarian and vegan lentil loaf is a delicious meatloaf substitute! Be sure to use green or brown lentils, not red. Preheat the oven to 350 degrees F. Line a baking sheet with parchment paper. In a large skillet over medium heat, saute onion, carrots, celery, pepper, and mushrooms with a pinch of salt and pepper until softened. Add the garlic and saute another minute longer. In a food processor, pulse together the lentils, cooked vegetables, tomato paste, bbq sauce, flax meal, parsley, salt, pepper, oats, and breadcrumbs. You may have to work in batches if your food processor is small. Do not puree, but blend into a chunky dough. You want some bits of veggies for texture. Form the dough into a ball and place on the prepared cookie sheet. Form into a “loaf” shape as shown in the pictures. Alternatively, fill bell pepper halves with the lentil mixture and place in a baking dish. Bake for 35 minutes. Remove from the oven and spread the ketchup on top. Sprinkle with sugar to help caramelize the topping. Bake for another 10 minutes. Let the lentil loaf cool at least 10 minutes as it firms up during this time.